The advantage of an audio interface over the standard computer sound cards is that it offers better access to various input types that sound card lacks, such as an XLR input to connect a microphone. If you don’t have or don’t want to use USB microphones, you have no choice, but to use an audio interface. Audio Interfaces range from very cheap models to professional studio-quality devices. This article compares two very popular models, namely Behringer UM2 and Focusrite Scarlett Solo. While Behringer is much cheaper, Focusrite Scarlett is also a budget interface. What’s the difference between the two and whether the higher price of Focusrite is justified? Let’s find out. Both devices are designed with portability in mind. Especially the very budget Behringer UM2. At this price point, you can’t expect top-notch design. The quality of the chassis feels sturdy and durable, despite being made of plastic, without any metal parts. Overall the quality seems satisfactory, with a good finish, but I feel that it can be easily damaged when traveling. The Solo offers much better quality than Behringer. But it shouldn’t be surprising considering the price. Instead of plastic, Focusrite uses a red brushed aluminum casing with composite masks at the front and the back. When it comes to aesthetics, Focusrite devices are the best looking audio interface you can find on the market. Both devices offer two inputs. One of which is a combo, where you can attach an XLR or 6.35 mm microphone. The second input is a dedicated instrument level 6.35 mm for connecting guitar or bass. Each input has a pair of associated LEDs on the front panel. The green LEDs light when a signal is detected, and the red when the signal is clipping. There are also two other LEDs: the yellow is lit when the device is connected to a power source, and the second one, if the Phantom power is active. Phantom Power allows you to use condenser microphones and the switch is located on the back of the device. On the front, there is a direct monitor button. When you press it, it will route the input signal directly to your headphones with almost zero latency. The three knobs are on the top of the device. One of them is for a microphone and the other one is for instrument gain control. With the third knob, you can control your monitors. Focusrite offers a bit more than Behringer when it comes to aesthetics. The LEDs that show signal and clipping are located around the knobs. I find this to be more elegant and practical than the way it’s done in UM2. The knob to control both your headphones and rear panel line outputs is also located on the front, it’s bigger and has a perfect resistance when I turn the knob. When it comes to recording quality, at this price, the device is unbeatable. But UM2 has at least one big disadvantage that is not present in Solo or other more expensive models. Behringer is limited to 16-bit/48 kHz recordings. Which can be fine for amateur musicians or streamers, but if you want to be more serious about music, you should choose Solo or Behringer UMC202HD which is twice as expensive as UM2. The higher 24-bit playback also allows you to hear the samples you use in a DAW with audible differences and a greater depth. In the second generation of Scarlett Solo, Focusrite installed a very decent, low-noise, low-distortion and natural-sounding preamp. This is the same technology that Focusrite uses in their flagship products. With sample rates up to 192 kHz, you have a studio-level sound quality in a portable form. The instrumental input has also been upgraded to handle hot pickups. The latency on the second-generation units is two times lower than in the first model, making the device much more usable, providing much better monitoring. You can check the latency numbers on the Focusrite website. Both interfaces come with lite versions of popular DAWs. Behringer includes Traction software. To get this app you have to register the product with Behringer to get the redeem code you can use on the Traction website. 1GB of Loopmasters sample content. PROS: Price / decent recording quality / Much better than much more expensive soundcard. PROS: Great recording quality / nice LEDs / great build quality / A lot of free software. CONS: 16-bit/48 kHz recording / plastic chassis / Not enough free software. CONS: Much more expensive than UM2. 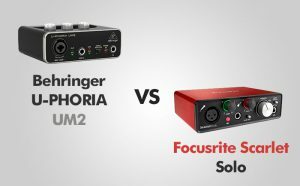 No one should be surprised that the Focusrite Solo is a better audio interface than Behringer UM2 and if you are thinking seriously about your music career you should choose Solo. But on the other hand, Behringer is a few times less expensive and if you don’t need a studio-level recording quality because you are an amateur musician, podcaster or streamer, you can choose UM2 and it will be way better than your much more expensive sound card. I highly recommend musicians to go with Solo, or even 2i2/2i4. If you want to earn money from your work, you shouldn’t choose the cheapest audio interface you can find.